Brinjal fry or Begun vaja (বেগুন ভাজা) is what we say it in Bengali, was not my favorite food at all until recently, when I moved to Dubai from my home city Kolkata. That was the time when I truly realized that how much I love Bengali foods. I love any foods though so that’s a different thing of me. When I was a kid (until a few months back I guess), there were a very few foods that I used to eat. But now, there are a very few things that I don’t eat. It is a very simple yet very tasty thing I have tasted ever. All you have to do is to fry some Brinjal. No marination required, or you can add anything you like would enhance the taste or color. Like we have added some turmeric powder for color and flavor. Salt is one common thing I suppose, no need to mention. 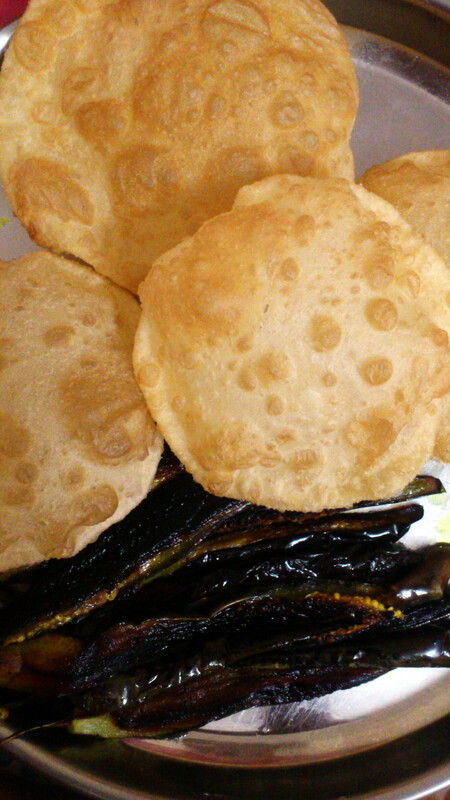 I love it most when combined with Poori or Luchi (লুচি) which my childhood crush. I am really pleased to have it after so many days! It was like meeting an old friend after long time! Heavenly! Please note that Brinjal is also known as Egg plant in some places outside of Asian subcontinent.